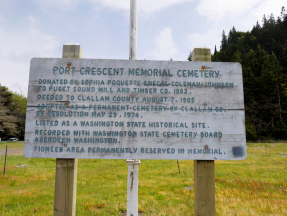 The land for this cemetery was donated in 1882 by Isobel Sophie E. Poquette Johnson to Puget Sound Mill and Timber Company. Sophie was a pioneer of the Crescent community prior to 1870 and was a midwife, who nursed the loggers and families. She is buried here with her husband, two sons and a brother. 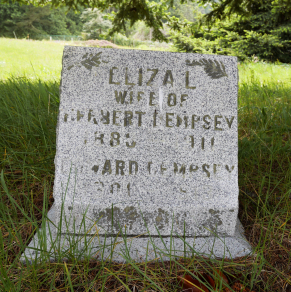 The cemetery was deeded to Clallam County in 1905. They installed gates and a chain link fence. A large granite stone, at the entrance, was dedicated in 1983. It has a bronze plaque inscribed with a list of 66 burials from 1876 to 1980. By 1988, there were at least 93 burials. A cemetery survey in 2010 listed 129 burials. This list includes inscriptions from the gravestones. As of 2015, there were 149 burials posted on the Find A Grave website. Burial lists, which may have additional information, are located at the Clallam County Genealogy Society. This cemetery is listed on the Washington State Historical Site, and recorded with the Washington State Cemetery Board.